This book explores the intersection of food and foodways from global and local perspectives. The collection contributes to interdisciplinary debates about the role and movement of commodities in the historical and contemporary world. The expert contributions collectively address a fundamental tension in the emerging scholarly terrain of food studies, namely theorizing the relationship between foodstuff production and cuisine patterns. They explore a wide variety of topics, including curry, bread, sugar, coffee, milk, pulque, Virginia ham, fast-food, obesity, and US ethnic restaurants. 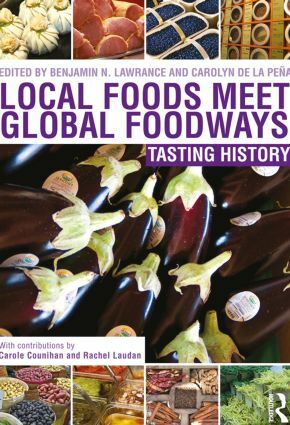 Local Foods Meet Global Foodways considers movements in context, and, in doing so, complicates the notions that food 'shapes' culture as it crosses borders or that culture 'adapts' foods to its neo-local or global contexts. By analysing the dynamics of contact between mobile foods and/or people and the specific cultures of consumption they provoke, these case studies reveal the process whereby local foods become global or global foods become local, to be a dynamic, co-creative development jointly facilitated by humans and nature. This volume explores a vast expanse of global regions, such as North and Central America, Europe, China, East Asia and the Pacific, India, sub-Saharan Africa, the Atlantic Ocean, and the USSR/Russia. It includes a foreword by the eminent food scholar Carole Counihan, and an afterword by noted theorist of cuisine Rachel Laudan, and will be of great interest to students and researchers of history, anthropology, geography, cultural studies and American studies. This book is based on a special issue of Food and Foodways.